There is a pervasive stigma about motorcyclists. Many people believe that they are reckless drivers with a thirst for adventure and danger. The truth is that a motorcycle is a vehicle that hundreds of thousands of people use to get from point A to point B every day. Motorcyclists have the same rights as car and truck drivers to safe roads and safe driving conditions. 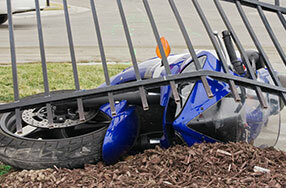 Dangerous road design can result in motorcycle crashes. City and state governments have a duty to design and build roads that are reasonably safe for motorists. In designing our highways, they must consider safety for all types of vehicles expected to use the road, including motorcycles. In some situations, a road condition may be perfectly safe for cars and trucks, but unsafe for motorcycles. For example, an unmarked bump or drop-off in the pavement may feel like an uncomfortable jolt to occupants of a vehicle passing over it. To an unsuspecting motorcycle rider, the exact same condition may cause them to lose control and be thrown from their bike. For more information on dangerous road design claims in general, click here. When a crash results from dangerous road design or construction, those involved may be entitled to compensation for their injuries. Bringing claims related to defective road conditions can be tricky, and is difficult to do without a lawyer. For example, very technical evidence is required, which generally involves hiring engineers and other highway design experts to examine the location of the crash and provide testimony regarding how the location at issue did not meet accepted highway design or construction standards. As discussed in our page on motorcycle crashes in general, the devastating consequences of motorcycle crashes are frequently magnitudes worse than other types of crashes. The consequences to an injured biker can be life-changing. Severe injuries often render people unable to work and earn a living. On top of that, medical bills pile up at a time the person is least able to afford it. The mental impact of the resulting pain and disability is often debilitating. The lawyers at Kraft Davies, PLLC, are accustomed to handling complex injury cases, including injuries caused by defective road conditions. We have the knowledge and resources to fully investigate and pursue defective road condition injury and death claims. We offer free consultations, and provide our honest, candid opinion about the merits of your claim and your legal options. We know how to handle claims from start to finish to place our clients in the best possible position for a favorable settlement. However, we prepare every case as though it will go to trial so that in the event there is not a suitable settlement offer, we are ready and willing to pursue your rights in court.